Today, as a companion to The Oral History of the 1996 Chicago Bulls published last week, we take a closer look at the formation of the Supersonics from that same season, and basketball in Seattle. When former Sonics general manager Bob Whitsitt looks back at his tenure in Seattle in which he earned the nickname “Trader Bob” for his volume of transactions and helped put together a core group that won 64 games and made the NBA Finals in 1996, he remembers two major risks that paid off. Entering the 1989 draft with two first round picks (16th and 17th), Whitsitt was convinced the 19-year-old Shawn Kemp was a combination of Charles Barkley and Dominique Wilkins. Owner Bob Ackerley disagreed, but Whitsitt decided he would sleep better at night if he went with his intuition. Kemp was so young his mother had to co-sign his first NBA draft. But in practices, Whitsitt saw a teenager with physical gifts and a mental toughness that would make him a special player. Kemp refused to back down each day against teammate Xavier McDaniel, eventually he became the team’s franchise player. A young Gary [Payton] was pretty brash. He didn’t really have an off button and rubbed people the wrong way. The following year, Whitsitt used the No. 2 overall pick to select a point guard named Gary Payton from Oregon. “A young Gary was pretty brash,” Whitsitt remembers. “He didn’t really have an off button and rubbed people the wrong way.” Nate McMillan, a veteran guard drafted in 1986, was able to keep the locker room together. According to teammates, Payton, who was known for his constant chatter on the court, never stopped talking in practice either. The Sonics had two generational talents in Payton and Kemp to build around. But in the middle of the 1991-92 season, they needed a new head coach. K.C. Jones was let go in January. Whitsitt was tasked by Ackerley to select a new man in charge. He remembered being intrigued by George Karl, who had last coached in the NBA in 1988, but had bounced around the CBA and overseas and was currently working for Real Madrid in Spain. In conducting his background checks, Whitsitt talked to over 40 people around the league about Karl. Many of them told Whitsitt to pursue someone else. Karl wasn’t worth the trouble, they told him. But Whitsitt also saw a brilliant basketball mind, a personality that could mesh with the Sonics roster. In their interview, Whitsitt asked Karl if he would join the team as an assistant coach. The intention was to always hire him as a head coach, but when Karl said yes to the request, Whitsitt received the assurance he needed that Karl had been humbled and made the hire. “He became a really good coach in Seattle,” Whitsitt said. In six full seasons with Seattle, Karl’s teams won at least 55 games every year. 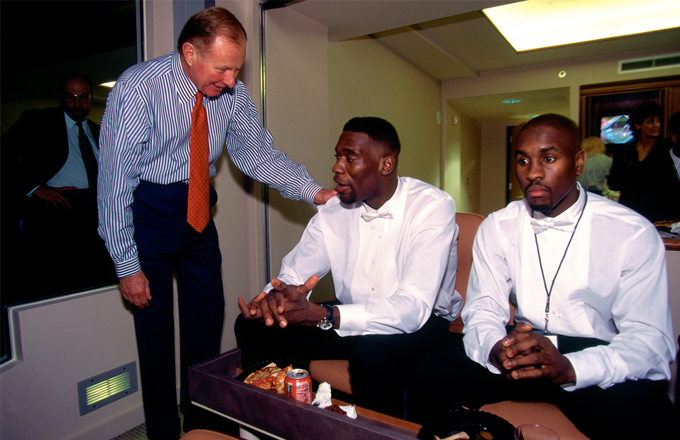 Owner Barry Ackerley talks to Shawn Kemp and Gary Payton in Seattle in 1995. Image via Jeff Reinking/NBAE/Getty Images. The Sonics had progressed from the first round, to the semi-finals, to the conference finals the previous three seasons. In Whitsitt’s mind, this was the first setback for the core group. The championship window was still open. 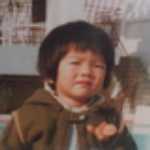 There was no need for drastic changes. But Ackerley thought differently, asking Whitsitt to fire Karl after their embarrassing playoff exit. Whitsitt pleaded with his owner to cool off for a week, and then make the decision. A few days later, Ackerley held a press conference announcing Whitsitt had resigned. When Whitsitt went back to his office the following week, his computer, phone and office files were gone, his secretary went on paid leave. Jordan encouraged his fellow North Carolina alumni to make the deal, telling [George] Karl the Sonics would win a championship with Pippen. With several years left on his contract, Whitsitt agreed to be paid for one additional month, not join another team prior to the NBA draft, and then be free to pursue another role. He joined the Trail Blazers that offseason, leaving a team he had built in Seattle before they reached their apex. Whitsitt’s departure left a vacuum in the Sonics’ front office that summer. Wally Walker—a member of the 1979 Sonics championship team—was hired as a consultant, and later became the full-time general manager. In the summer of 1994, Karl explored a Scottie Pippen for Kemp trade with the Bulls. According to reports, Karl had a conversation with Michael Jordan about the potential trade. Jordan encouraged his fellow North Carolina alumni to make the deal, telling Karl the Sonics would win a championship with Pippen. Kemp remembers how close the trade was to happening. “Ackerley called me and told me they weren’t going to make the trade,” Kemp said. “He was telling me people were calling the local radio stations saying they were going to burn down the stadium if I was traded.” Just prior to the 1994 draft, the Sonics told the Bulls the deal was off. 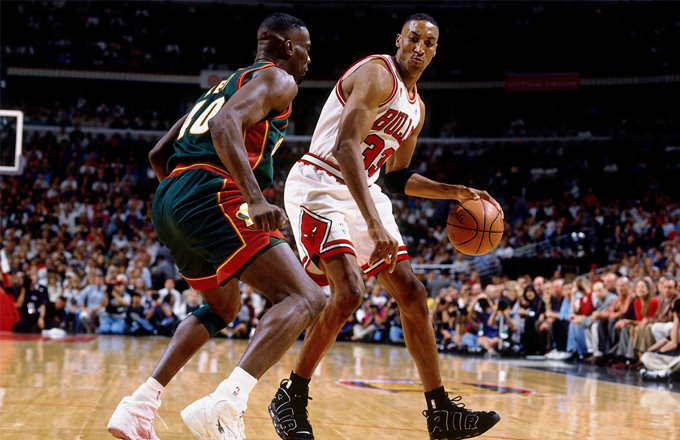 Scottie Pippen backs down Shawn Kemp during the 1996 NBA Finals. Image via Nathaniel S. Butler/NBAE/Getty Images. Two years later, Pippen and Kemp would meet in the NBA Finals. Kemp averaged 23.3 points and 10.0 rebounds in the Finals, but the Bulls—who won 72 games during the regular season—would defeat the Sonics in six games. The Sonics would never return to the Finals. Kemp played one more season in Seattle then was traded to Cleveland. Karl left after the 1997-98 season. Payton was traded to Milwaukee in 2003. The Sonics were relocated to Oklahoma City in 2008 and became the Thunder. There are no Sonics. 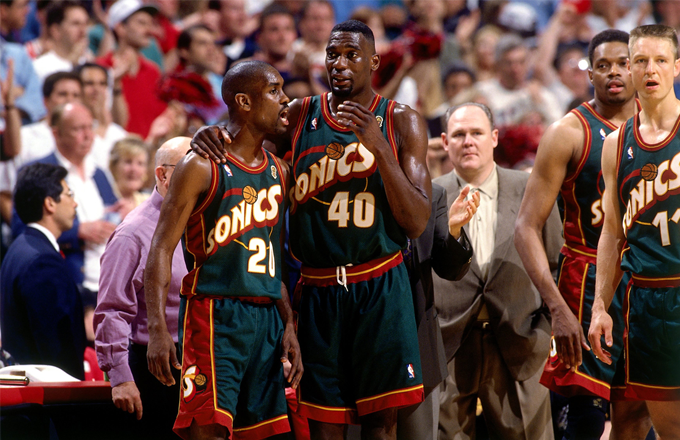 Twenty years later, Sonics players have their own what-ifs when they look back on their run in Seattle. For Kemp, the ‘96 season doesn’t bother him as much. Instead, he looks at the two years in ‘94 and ‘95 when the team failed to make it out of the first round despite successful regular seasons. “We let a great opportunity go those two years,” Kemp said. If they win the championship in ‘96, would Kemp have left? Would [Barry] Ackerley sell [the team] to Howard Schultz? 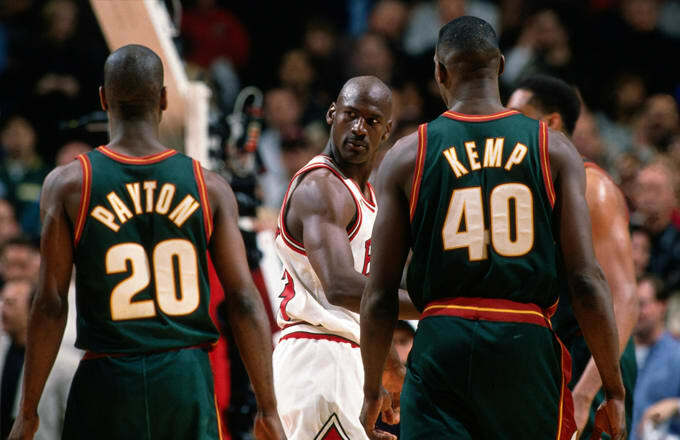 Gary Payton and Shawn Kemp talk during Game 6 of the 1996 NBA Finals. Image via Andrew D. Bernstein/NBAE/Getty Images​.